HIghest point of Araku…, a photo by Arindam "mak" Ghosh on Flickr. Mukti is the national level technical fest organized by NIT, Durgapur. 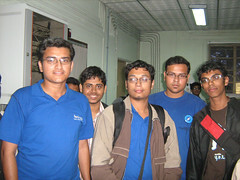 On the afternoon of 6th February, we (Subhodip and me) went there for ‘A Day with Fedora’. Satya also showed up after her talk to help us. As scheduled, we had a 3.5 hour slot in the evening for our talk and workshop. 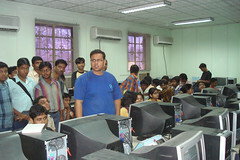 Thanks to our hosts, they arranged for a computer lab in their IT department with ~10 computers. Due to other talks and/or events maybe, we had to start it 30-45 minutes late. By this time, the room already had 40-50 students. I started with ‘Introduction to Fedora‘. I emphasized on ‘Freedom | Friends | Features | First’; explained how Fedora Project is a community of contributors worldwide much more than just a free software. They really liked the ‘Fedora 10: A Community of Future’ and ‘Truth Happens’ videos. 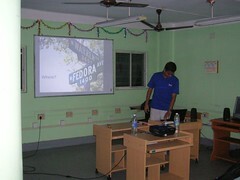 I also categorically explained to them how they can contribute to Fedora Project in various ways. My talk went on for an hour. After that Subhodip went up to bust the ‘Myths of Linux’. He went on crushing them all one after the other. It was kinda cool to see people understand that there’s nothing that can’t be done in Fedora. He wrapped up with a video of gregdek on “Why Fedora?” Then we moved on to the workshop part. We had mostly a beginner audience. So, running short of time we did a workshop on “Fedora Live” for helping people create their own custom Fedora spins, and also create their own Fedora LiveUSB. We actually used FEL LiveCD iso for this stuff. We went on after that taking different questions and as we answered them showed how easy was package installation with PackageKit; little things about firewall and proxy settings. There were quite interesting questions. Like Rangeen of NITDGP asked for support for organizing talk/installfest at a school in Midnapore. We told him to contact us for any help. He requested for 5-6 F10 media which was provided. Also another guy from NIT Agartala actually complained of low connectivity at his college. So advised to actually form a LUG there, and on his request also told organizers to give 40-50 F10 DVD’s to help him. According to the data we got around 52 odd F10 media were distributed in the Linux stall set up by the NIT lug guys. Overall, it was a really great day! More snaps are over here. Just sat to jot down my mind. 1. Travelled to few interesting places lately. 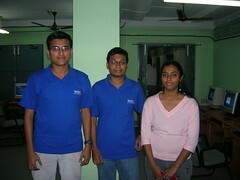 To begin with, had a trip to Vishakhapatnam with my friends during christmas. Some photos are here. After that went to Ganga Sagar Mela (fair) in mid-January. As the common belief goes, most go there to wash off their sins with a holy dip in River Ganges. It was more or less fun out there. But felt like they (authorities) can do a lot more to boost tourism in the place where 15-20 lakhs of pilgrims visit in just 3 days. 2. Had a jiffy trip to Kolkata Book Fair. Helped guys at the IOTA stall. It was about promoting Free Software, with nice demos to people coming around and lot more. 3. Visited Bijra after quite some time. kishan, rtnpro & gang also went to have an overview. Had interesting feedbacks. 4. 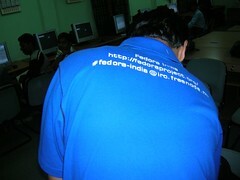 Talks & workshop on Fedora at Mukti’09. For updates check event page. 5. My internet has been acting up for the last week. I *hate* network timeouts. But now i’m using OpenDNS and its’ working great.